She is called the most ‘kissed face in history’, but we know her as Rescue Annie. 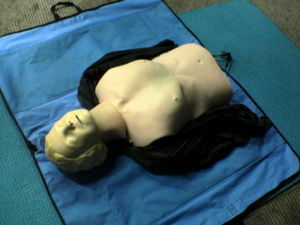 Most of us will at one time or another meet her in a First Aid class, and be forced to test our CPR techniques on her for a possible emergency. She will be lying there all too lifelike but silent. But she does have a story: she is the face of a woman who lived and died in the nineteenth century. Nicknamed L’Inconnue de la Seine, she was pulled out of the Seine River in the 1880’s, as a possible suicide victim. A pathologist at the morgue was so taken by her beauty that he made a plaster cast death mask of her face. Her identity was never discovered. Peter Safar was an Austrian, who moved to the States in the late forties, and worked as an anesthesiologist. Together with James Elam, the two discovered the CPR technique. Needing a mannequin, the two turned to Asmund Laerdal, who was a Norwegian doll maker who fashioned Rescue Annie. It is Laerdal who made the decision to give Annie the face of L’Inconnue de la Seine. Perhaps for him it was a fitting combination: paring the face of a drowned woman with the hope of survival. A strange tale of Sleeping Beauty. This entry was posted in Education, historical and tagged art, Asmund Laerdal, CPR, James Elam, L'Inconnue de la Seine, Peter Safar, Rescue Annie. Bookmark the permalink. what a cool story; sleeping beauty indeed.